Drink plenty of water and consume a healthy diet. Exfoliate the lips twice a week using a mild sugar scrub or a soft bristled toothbrush. Moisturise the lips using a natural and chemical free lip balm 3-4 times a week. I am a lip balm hoarder, like I love lip balms beyond acceptable levels. Oh well. I will be about talking one such lip balm from my kitty, which comes from the house of Organicmill. The brand had sent me a couple of products to try one which was this lip balm. I also did a brand story which may be read HERE. Um, so, keep reading the post to know how the product fared for me. Organicmill is 100% chemical and preservative free organic skin care beauty range. Products are freshly prepared on order basis. 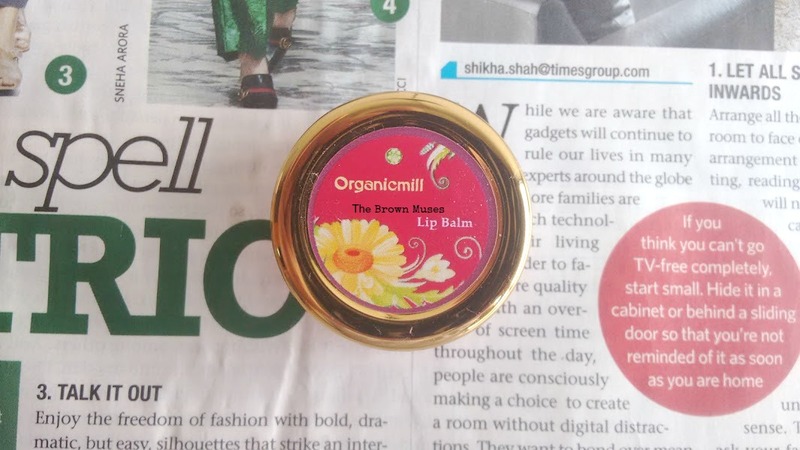 Organicmill lip balm comes in an acrylic jar with gold coloured lid and an inner plastic disc to further protect the content. The packaging bears labels mentioning price, ingredients, shelf life, date of manufacture and usage instruction. I love the no frills simple packaging of this product. Rose Essential Oil: Rose oil is traditionally used to calm and uplift. It is an anti-inflammatory, cooling and soothing oil, and as such is beneficial for dry, hot, inflamed or itching skin and for many other inflammatory conditions, like conjunctivitis (although it would be rose water rather than the oil that is used for this). In addition, rose is excellent for treating scarring, broken capillaries and mature skin types. Rose’s cooling and soothing properties are excellent for treating stress related conditions in adults and children. Containing only three ingredients and smelling delightfully of roses, the lip balm is baby pink in colour and has a soft texture. It applies clear on lips and doesn’t feel heavy at all! I am a huge shea butter fan because of its intensely moisturizing properties. To use, I take required amount using my finger (always use a clean to scoop out the product OR you may use a Q-tip!) and apply it on the lips. The lip balm glides on easily and nourishes the lips, making them super soft. It keeps my dry lips moisturized for over 6-7 hours before the need for reapplication arises. I cannot comment on it's ability to heal chapped lips but, it should as, it contains shea butter. I have noticed that consistent use render healthy appearance to the lips. My lips appear pinker too. Since the lip balm contains no chemicals or petroleum jelly its safe for kids too. 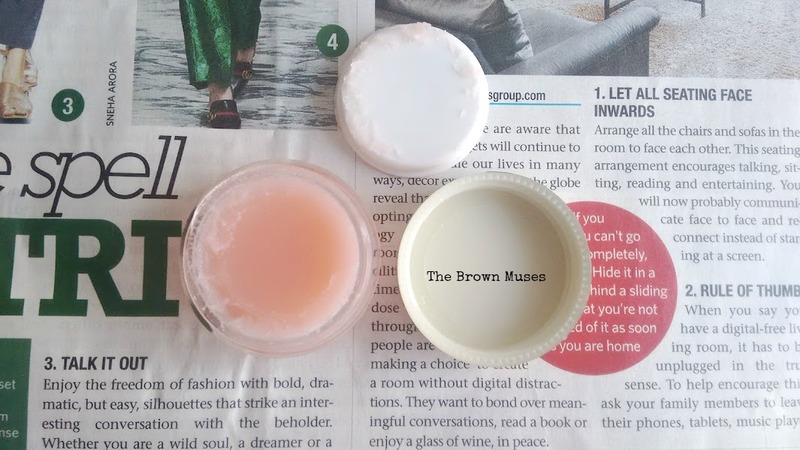 All in all, it’s a wonderful lip balm, in fact, I would say one of the best lip balms I have used to date and a must try albeit a little pricey for the quantity. Super moisturizing. Doesn't require frequent reapplications. Lips appear healthier and pinker upon consistent use. Makes the lips super soft. Availability – Not for me though, as I do not mind buying online. Some may find the packaging unhygienic. 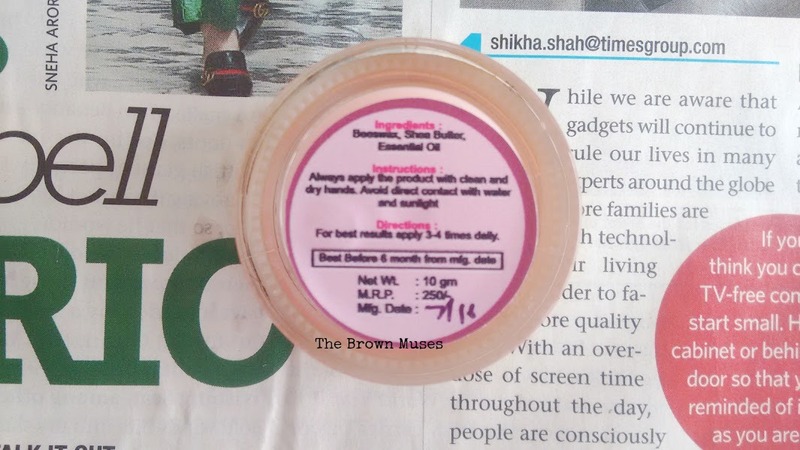 Price and availability: The lip balm is priced at INR 250 for 10 gm. Hop on to the brand's facebook page HERE or WhatsApp Mrs Dishi Jain on +91-99716 48091 to place your orders. Did you Organicmill lip balm? If so, then share your experience in the comments section below. We love hearing from our readers! Disclosure: The product is a PR sample and the views and opinions expressed hereby are strictly unbiased, based on my personal experience. Such a Nice Information !